Today has been a long day and I thought before I retire I wanted to share this photo I took a few years ago. A neighbor of mine had a small greenhouse in the back of her home. She wanted to show me her beautiful plants. I followed her as she walked to the back of her house. There, resting on the lawn was this quaint greenhouse. I was very impressed. She went inside and I decided to photograph her while she was pruning her plants. I loved the way the glass muted her face. Please let me know your response to Woman with Plants – I’ll be looking forward to your comments. Thank you so much for coming by today. Still hoping to photograph the amazing diamonds hanging from the branches that I saw last week. It’s been quite warm recently, but I heard snow is coming on Sunday. Perhaps that maybe another opportunity to photograph the jewels again. Tomorrow I have another photo shoot of the mayoral candidate. 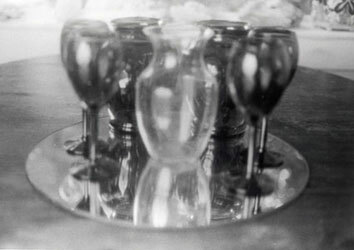 I’m looking forward to creating interesting images. Tonight I’m quite tired after a long day of putting numbers together for record keeping of my photography business. I’m so delighted you came by – I always look forward to hearing from you. Please leave a comment if you wish. Good night. I’ve been pretty busy with doing some things that needed catching up on – little everyday stuff.Â Now my work week has begun so not much photographing this week. I’m planning to do so at the end of the week. Our area of Massachusetts was blanketed with a magical layer of heavy, wet snow.Â I love getting into my car and driving along the farm roads in the towns near where I live. Did take my camera along, took some imagesÂ – so amazing to me the glorious change snow creates.Â I spent around two hours driving all over watching the snow cover all that it touches.Â For me, the best time to photograph is during the snow storm – that’s my favorite time to go out. Someone once told me that whatever season you were born in – tends to be your favorite time of year.Â My birthday is in December and actually Winter is my favorite season. Does that statement ring true for you?Â I’d be interested in your response. Shimmering Barn. Â A blue lagoon lay still as a sleeping barn reflects itself unknowingly.Â The barnâ€™s reflection beckons you to ponder its point of view. Trunk Show – Please Join Us!! 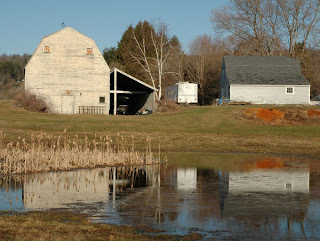 Gray Barn showcases fields flooded creates an amazing reflection of a local farm landscape. A contemplative, serene atmosphere for your Zen rejuvenation. Please join us Wednesday evening, 7:pm est. at the wonderful Welcome Spring Vast Trunk Show. Check out the other exciting photographs in my etsy shop. I’m so excited about being part of the Vast Trunk Show. An amazing group of people who are participating.Â Hope you can join us. Tomorrow (Wednesday) I will share with you my Arcade portal. I’m so delighted in how it looks. It’s a great place to showcase my photographs both as prints, mugs, tiles and more from various shops.Â This way you can see them all rather than going shop to shop. It’s a one-stop-shop. Looking forward to seeing you there.